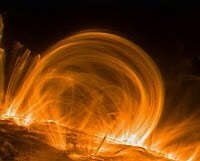 Solar Wave Modeller: Happy Birthday SDO! It has been a week of highlights! News was announced of The University of Sheffield's involvement with the Daniel K Inouye Solar Telescope (DKIST). With a four metre diameter primary mirror "the telescope will be able to pick up unprecedented detail on the surface of the Sun – the equivalent of being able to examine a £1 coin from 100kms away". Further information about DKIST is on its own site and wikipedia. The first total eclipse of the Sun to be visible in Northern Europe since that of 11 August 1999 will take place on 20 March 2015. Further new is provided by The British Astronomical Association. NASA have prepared a news item about SDO's 5th year - "New Videos Highlight NASA SDO's Fifth Anniversary". On February 11th launched NOAA’s New Deep Space Solar Monitoring Satellite on a SpaceX Falcon 9 rocket from Cape Canavarel. An issue with the tracking meant that the launch was delayed from February 8th. The Deep Space Climate Observatory, or DSCOVR, is a spacecraft which will orbit between Earth and the sun, observing and providing advanced warning of particles and magnetic fields emitted by the sun (known as the solar wind) which can affect power grids, communications systems, and satellites close to Earth. From its post at the Lagrange point 1 (or L1), approximately one million miles from Earth. 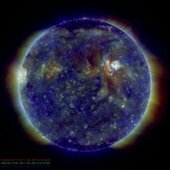 An excellent review is provided by Universe Today, "NOAA/NASA/USAF Deep Space Climate Observatory (DSCOVR) Launching Feb. 8 to Monitor Solar Winds".